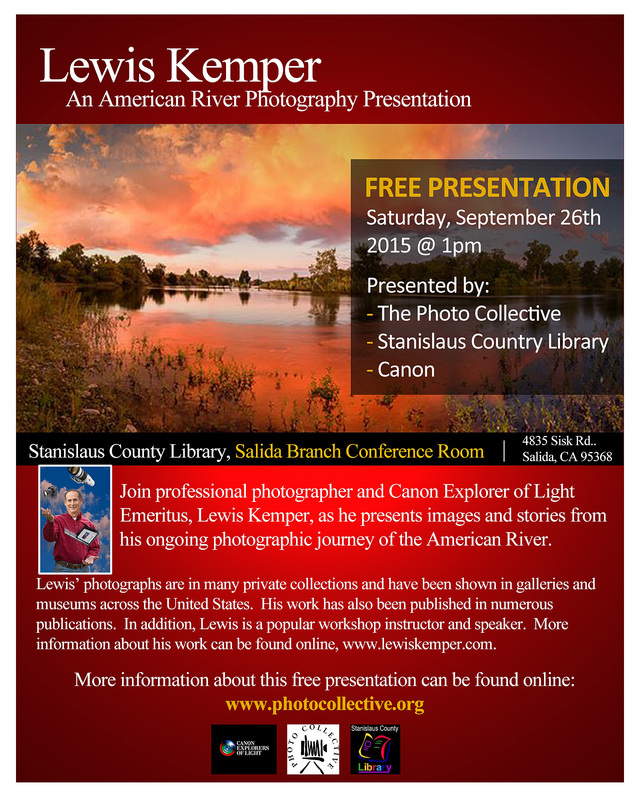 We invite you to attend a free public photography presentation sponsored by The Photo Collective, the Stanislaus County Library, and Canon. Lewis Kemper has been photographing the natural beauty of North America, and its parklands, as well as helping others improve their photography for over three decades. During his extensive travels, he has been to 47 states from Alaska to Florida. His work has been exhibited and published in magazines, books, and calendars worldwide. Lewis sells fine art nature and wildlife photography, stock images, training DVDs and books; teaches photography and Photoshop, Lightroom and PhotomatixPro classes; and lectures at colleges, camera clubs and trade shows throughout the USA. You can also check out Lewis' multimedia adventure, "My Stretch of the River: A Photographer’s Journal." Please note that seating is limited to 200 people for the Conference Room. Please RSVP for yourself and any guests on Meetup which allows us to utilize a waiting list, if necessary. If you are not already signed up on Meetup, it is free to join.